Komar and Melamid, You Must Feel Good!, 1972 (From Sots Art series). Oil on plywood, 45 × 65 cm. Shalva Breus Collection. The Moscow Museum of Modern Art together with BREUS Foundation presents an exhibition of the founders of Sots Art Vitaly Komar and Alexander Melamid. 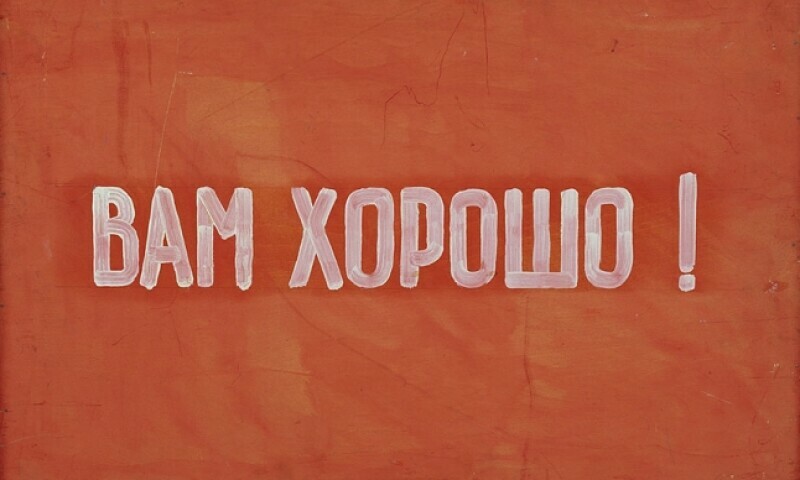 This is the artists’ first retrospective in Russia. The exhibition includes works created by the artists as a tandem, which they now call «a character named ‘Komar & Melamid’». Among them are more than 20 iconic pieces from the collection of BREUS Foundation. The works Komar and Melamid produced before 1972, the year when the collective was formed, and after 2003, when it ceased to exist, are not included in the show. In its design the show resembles a collection of quotes — works and archival materials from the artists’ iconic projects. The famous Sots Art series, which gave birth to this movement, is reassembled as it was shown for the first time at a Moscow apartment exhibition in 1974. Although Komar&Melamid’s largescale projects, such as «People’s Choice» (1994-1995), which demonstrates the «most wanted» and «least wanted» paintings of various countries, are represented by only few pieces, thematically grouped, they convey the artists’ key ideas. The character Komar & Melamid came to life with the aim to abolish Socialist Realism’s monopoly in the USSR, discredit modernism in the West, and build a new international style, characterised by aesthetic and philosophical eclecticism. This imaginary character’s initial endeavour lies in the heart of the exhibition concept developed by Andrey Erofeev with the participation of Joseph Backstein. Occupying 16 halls on the second floor of the museum’s building at Petrovka 25, the show is divided into two sections presenting the artists’ Soviet and American periods. The way the show is designed reminds theatre sets — the exhibition designers Irina Korina and Ilya Voznesensky aimed to show the context underlying Komar & Melamid’s works. The installation-wise design is intended to immerse the contemporary viewer into the already distant reality of the 1970s-80s. The exhibition is designed in a way so as to guide the viewer through the labyrinth of the Soviet period halls, which evoke the cramped space of communal apartments, the «red corners» and clothing markets of the last century Moscow. The projects are shown in separate halls and are supplemented by annotations assembled in a brochure-guide. The journey through the show starts with the works that demonstrate Komar & Melamid’s creative method’s characteristic features — eclecticism, the focus on «bad art» and advertising aesthetics. They are followed by the projects related to the visual languages of state propaganda («Nostalgic Socialist Realism» series, 1981-1983) and kitsch. The mock use of the images of power is shown as the major tool of Sots Art.